Proposal(s) shall be sealed and clearly marked with the RFQ # and Project Title. The “Millers Creek Special District”, hereafter referred to as the “District”, created for the limited purpose of maintaining the portion of Millers Creek adjacent to the properties within the district’s boundaries to enable continuing access to the St. Johns River. 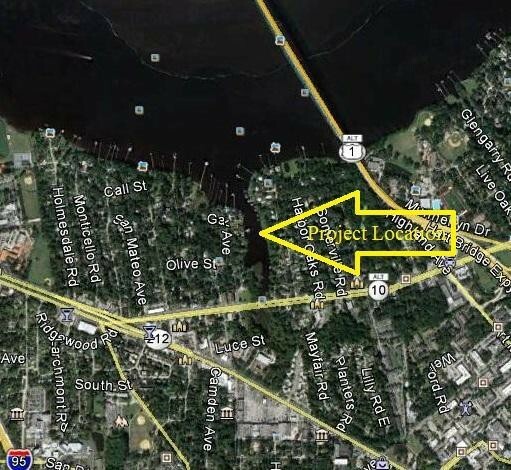 The District is soliciting the Professional Engineering Services request for qualifications to provide plans and specifications necessary to permit and perform dredging operations within Millers Creek in Jacksonville, Florida. The Millers Creek Special District is seeking qualifications from experienced and well- qualified licensed Florida professionals to calculate dredging sediment volumes; provide a sediment quality assessment to the relevant permitting agencies in support of episode approvals; prepare and provide engineering plans for bidding purposes; and provide construction administration services. The project is located at Millers Creek, Duval County, Jacksonville, Florida. The extent of the work includes the north entrance at the confluence of the St. Johns River extending southward to just north of Atlantic Boulevard from shore to shore except near the St. Johns River where the dredging will be approximately from the eastern shore to approximately 150 feet west of the eastern shoreline. Review existing conditions bathymetric survey performed in 2016, provided by the District. For inquiries regarding this request, contact Christopher Rose at christopherrosepsgccoj@gmail.com or telephone (703) 980-1359. The District will compile and respond to all respondents’ questions via email or an amendment issued to all respondents. Proposals shall be enclosed in a single sealed package. Respondent’s name and address shall appear in the upper left-hand corner of the package. All qualifications shall be identified with Millers Creek Dredging Design Services RFQ # 2017-A legibly written on the outside of the packages. Respondents shall submit one (1) original with three (3) copies of its Qualifications to the following address. The “original” shall be marked on the outside cover and contain a “wet” signature. Qualifications will be received until 4:00 p.m. EST April 28, 2017. Respondents may ask for a copy of the receipt for their Qualifications received after the stated time and date may be considered non-responsive and returned unopened. Provide an Engineer’s Opinion of Probable Costs for the dredging episode, including the actual cost to remove, dewater, and dispose of the dredged material, in addition to any anticipated ancillary project costs (e.g., environmental impacts, ). Provide assistance during bid period (pre-bid meeting, pre- and post-dredging survey acceptance, respond to bidder’s inquiries, bid opening, bid review, and tabulation, ). Provide monthly status in agreed upon format to the District board per agreed upon schedule. A cover letter shall be provided transmitting the consultant Qualifications for consideration. The cover letter shall be signed by the person authorized to negotiate a contract for proposed services with the District on behalf of the firm/team. For each firm on the proposed consultant team, describe history, expertise, and other narrative information. Provide consultant team organization chart, including all key personnel. Provide firm name, role and contact information for each member. Provide resumes of the key team members that will be assigned to theproject. Provide a broad summary of past experience as it relates to the scope of work. Provide a brief one (1) page summary for no more than five (5) similar projects within the last five (5) years. Provide contact information for references to each past project listed. Name of project manager and individual authorized to negotiate on behalf of the consulting firm. The final extent of the Sampling, Analysis, and Testing Plan will be determined during negotiation with the appropriate regulatory agencies. For the purpose of this RFQ, assume that three (3) samples will be collected and tested. This is an “as-needed” task. The scope of work and budget will be mutually agreed to in writing before initiating the work. After a consultant is selected, the award of a contract agreement is contingent upon the successful negotiation of terms, acceptability of fees, and formal approval by theDistrict. The District will determine if interviews are required. The District will select one (1) consultant team and negotiate a contract and fee. If the District is unable to reach an agreement with the selected team, the District will proceed to negotiate with the next selected consultant. Negotiations regarding agreement terms, conditions, scope of work, and pricing may or may not be conducted with consultant. Therefore, qualifications submitted should contain the respondent’s most favorable terms and conditions, since the selection and award may be made without discussion with any respondent. If satisfactory agreement provisions cannot be reached, then negotiations may be terminated. The District may elect to contact another firm submitting a proposal. This negotiation sequence continues until an agreement is reached. The issuance of this RFQ constitutes only an invitation to present responses. The District reserves the right, at its sole discretion, to determine whether or not any aspect of the response satisfactorily meets the criteria established in the RFQ. The District reserves the right to seek additional information and/or clarification from the respondent, the right to confer with any respondent submitting a response and the right to reject any or all responses with or without cause. In the event that the RFQ is withdrawn by the District for any reason, the District shall have no liability to any respondent for any costs or expense incurred with the preparation of this RFQ or related work. The District reserves the right, at its sole discretion, to waive any irregularities or informality. The District may conduct interviews with any respondent it deems necessary. The District reserves the right to reject any and all responses for failure to meet the requirements contained herein, to waive any technicalities and to select the responses which, in the District’s sole judgment, best meets the requirements of the project. All consultant team qualifications constitute an offer to contract, which will remain open for a period of at least 180 days from the date of receipt by the District. Arc Surveying & Mapping, Inc., Bathymetric Survey (2016).